To operate the cigarette lighter, press it in and release it. When it is heated, it automatically pops out ready for use. 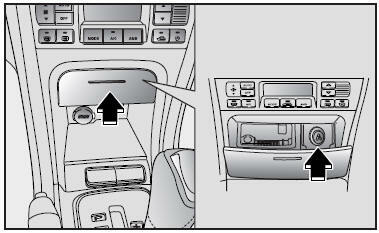 If the engine is not running, the ignition switch must be in the ACC position for the lighter to operate. Only a genuine Kia lighter or equivalent should be used in the cigarette lighter socket. The use of plug-in accessories (shavers, hand-held vacuums, and coffee pots, for example) may damage the socket or cause electrical failure.